WHAT IS... I AM ROBOT? 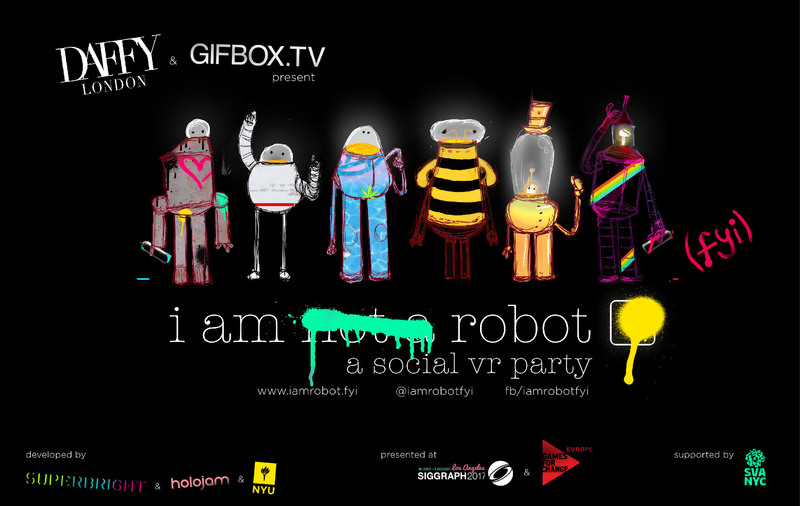 I AM ROBOT is wildly avante-garde and new social VR experience unlike any other. It premiered as the key installation at the VR VILLAGE at SIGGRAPH 2017, and then ran at g4c Europe in France in 2018. It was directed by DAFFY LONDON who rose to VR fame for his work directing the AVENGERS EXPERIENCE for SAMSUNG and MARVEL. A modification of Ken Perlins HOLOJAM build out of the NYU Vitual Labs, I AM ROBOT was a combination of artisrty and modernity, enguity and technical prowess of SUPERBRIGHT, NYU and the support of SVA and SIGGRAPH. "Over 4 days we fed roughly 1000 people through our non stop production line. 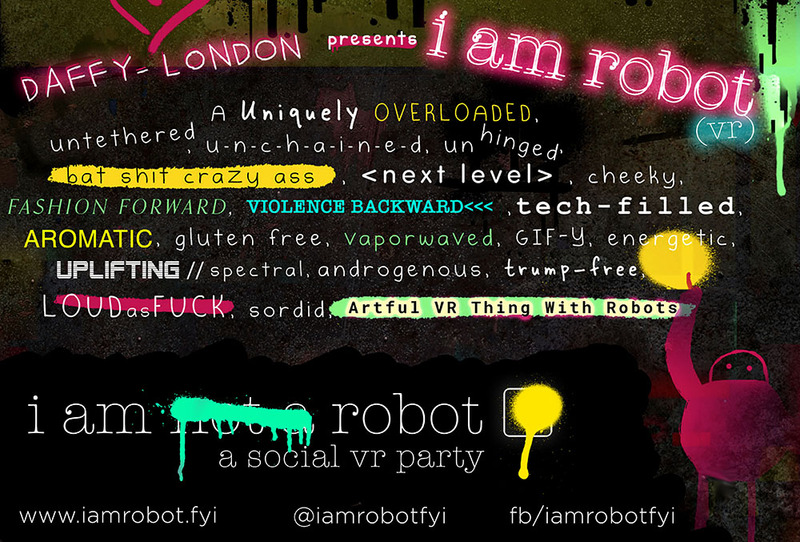 All with pre-concieved notions of VR, all presuming that assuming the form of a robot might add restriction. However, once they walked in, we saw miracles happen. Our beautiful, characters with built in core neutrality (no specific size, race, gender etc) took our stiff guests and gave them new ways to move. In the midst of a stale vast conference centre, we made a party, and a safe space for people to do what I'd describe as nothing less than frolicking. Daily we altered the experience, and our team of talented actors, developers, scientists and volunteers worked with our guests to make an experience that even DISNEY IMAGINEERS would be proud of. Inspired by theme park queues which deal with high volume flow, our party never ended. We capitalised on the common VR issue of people waiting by getting them more and more excited to be inside our universe. Instead of all activating at once, our guests would wait in turn for their own unique birth, assigned the role of a unique androgenous robot. Entering a full crowd and starting from "shy newbie" to becoming the old school "host with the most" throughout the journey. This alone peaked the social engagement. It made us as people tap into our base instinct to be kind, and show the new kid the ropes. As well as this there was lots to do. In the VR system, our guests got to interact (tetherless) with other robots, through art, dance, bubble volley ball, and our GIF game "OR". Grumpy men in suits with no time to spare were lynched by our people, and within minutes were fluttering and dancing as ballerinas. Tired old VR stalwarts were rolling on the floor like they were back at woodstock. Terrified looking people became dancing legends, and non-VR believers told us they finally grasped why people got so excited about this emerging technology. We had hoped, but could not have possible concieved that this would go so well. The concept can serve as a skin for other IP and franchises so I hope our discussions lead towards something permanent soon!" 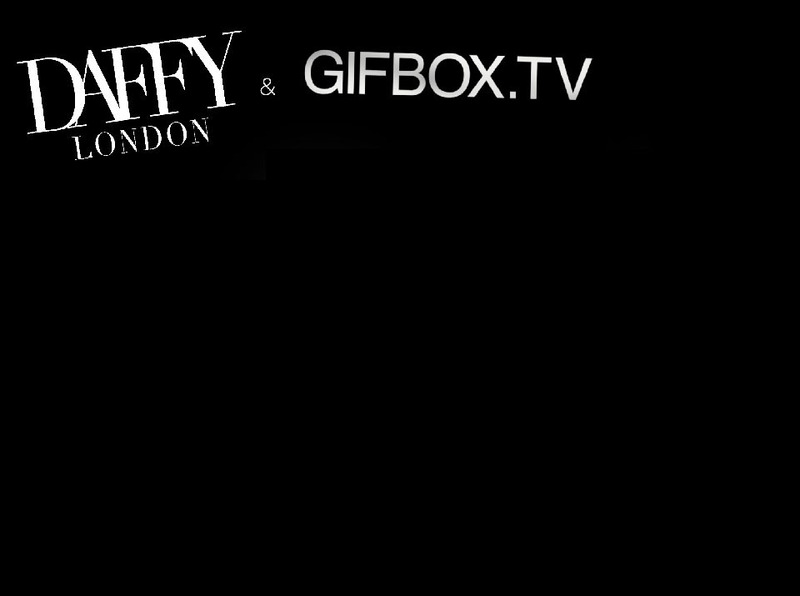 DAFFY LONDON designs I AM ROBOT to allow users to transcend their own physical body. Can Virtual Reality Change Minds? The Technology Paradox: What Does VR Add to Our Real Lives?